One of the things that I have noticed that I really miss as wintertime approaches is the wide variety of colorful blooms and greenery that cheerfully decorate the spring. There is just nothing else that seems to bring that bright and fresh feeling to our homes like living plants do. It seems like so many times we get caught up in all of the twinkling lights and Christmas themed ornaments that we tend to forget about decorating with holiday plants. When it comes to Christmas ideas for the home, live holiday plants can not only help us create wonderfully cheerful holiday displays, but they make excellent Christmas gifts as well. Why not welcome some lovely holiday plants into your home this holiday season? Whether you are considering enhancing your Christmas decorations with live plants this year, or you would like to give them as gifts, you have come to the right place. Rudolph and the other reindeer have spent hours searching for the most joyous holiday plants ever. Christmas Trees: While most people these days celebrate with a freshly-cut or artificial Douglas fir, pine or spruce to place inside their homes, some people choose a smaller, live tree that can be planted in the ground after the Christmas celebration is over. Poinsettias: Poinsettia, also known as the Christmas Star, is said to symbolize good cheer, purity and success, and bring wishes of great joy and celebration. Although more popular versions boast red or white “flowers” (the “flowers are actually leaves), they may have pink or speckled “flowers” as well. Rosemary Bushes: Making a comeback as a popular holiday plant in recent years, the rosemary bush is known as the herb of remembrance and is said to bring good luck to its owners. 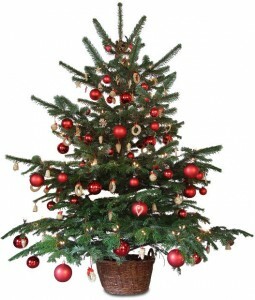 For the holidays, it is typically pruned to resemble a Christmas tree. Holly: A symbol of the promise Jesus made of eternal life, holly is often displayed as a live plant, or cut so that its branches can be used to create holiday decorations. Known for its tiny red berries and sharp, shiny leaves, this plant is an excellent choice when it comes to Christmas ideas for the home. Ivy: Signifying continuity and friendship, ivy branches are often used to make garland and wreaths at Christmastime. Live ivy plants double as easy to maintain holiday gifts as well. Christmas Cactus: The Christmas cactus produces vibrant blooms of magenta, pink, white and orange, and the lush flowers hang daintily from the leaves of the plant like Christmas ornaments. Amaryllis: A wonderful holiday centerpiece, the amaryllis boasts beautiful trumpet shaped flowers to celebrate the Christmas season. 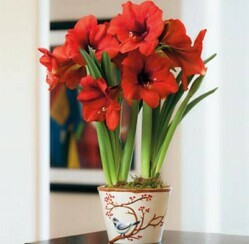 The amaryllis can be kept as a houseplant, and then transplanted when the weather accommodates. Mistletoe:Known for its small, white berries, the mistletoe is a holiday favorite when it comes to plants as Christmas ideas for the home. Christmas Rose: With beautiful white flowers that are said to bloom in the darkest of hours, the Christmas rose is a true holiday flowering plant. Winterberry: Winterberry is a beautiful holiday shrub that resembles holly. Unlike holly, however, winterberry sheds its leaves in colder weather to display an array of bright red berries. Do you plan to incorporate live plants in your holiday decor this year?